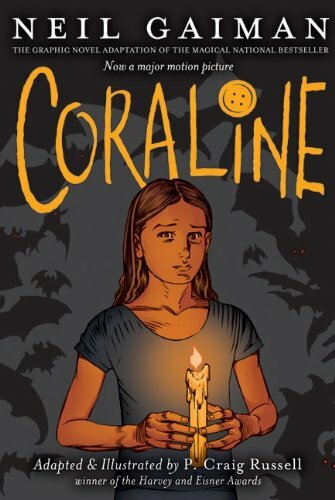 Through Scott McCloud’s Understanding Comics, I was able to pick up a few things that helped me appreciate a graphic/comic novel and connect those theories with Coraline. For example, McCloud discusses the differences between cartoons and comics, writing cartoons “deemphasize (a human’s) physical appearance” to help pull an audience away from realistic aspects to buy into what a cartoon is selling, so to speak (a way of seeing). Comics, he describes, uses realism that capture the “complexit[ies] of the physical world,” which is how we can separate cartoons from comics. While a comic artist takes realism into account, although not fully (“not exactly photo realist”, McCloud writes on page 42) they are tapping into the ideal audience and their expectations/responsiveness. For Coraline, I picked up on the minor details on how the illustrator separated the two Coraline’s (one in her alternate world setting, the other in her real life/normal setting). 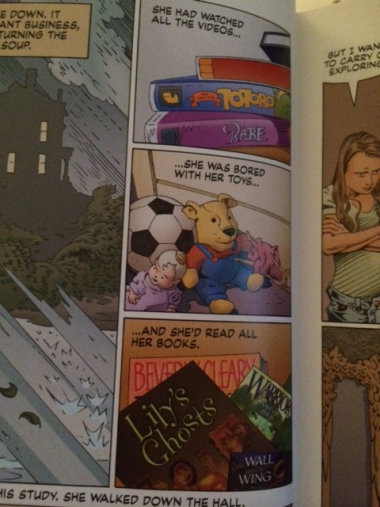 For example, as you can see here, in the opening pages (pg. 27), when Coraline is in her real life with her “real” parents, her face is naturally set, her eyes are smaller and there is a patient look on her face. She looks like an average teenager. 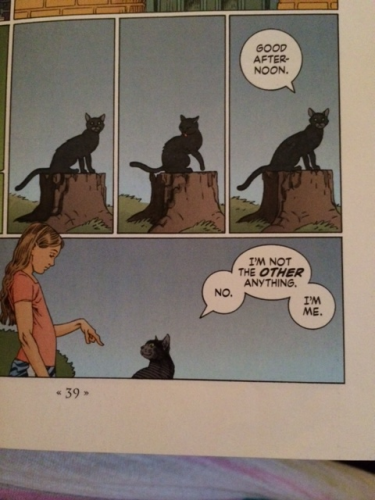 Coraline in her “real-world setting” (pg 27). Coraline in the “alternate world” (pg 51). I think this separation ties into the realistic concepts an artist must compose when writing in a graphic novel or comic book setting, along with how an audience can connect with the work. In the case here, Coraline is written for a young adult audience, which Russell taps into by drawing a character that looks like a real young teenager, like the ones reading this novel. As McCloud defines comics as sequential art, it relies on concepts such as closure/gutter (the action between the panels [gutter] that the audience is responsible for understanding [closure]), and transitions. 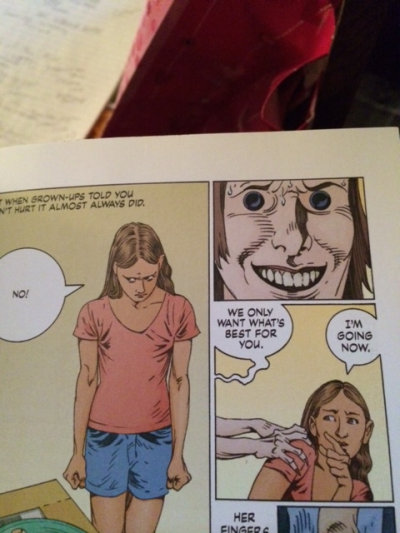 I can’t tell you the last time I’ve read a comic book, so I had to be extremely careful when reading not only Coraline, but Understanding Comics: I was worried about how to read the pages (left to right, up or down) and what each panel represented. I focused in on transitions when reading Coraline: McCloud counts six and each category requires either a minimal amount of participation from the reader to an extreme amount of participation. I noticed the Coraline transitions (panel to panel) rely mostly on “moment-to-moment”, “action-to-action progressions” and “subject-to-subject” transitions: which leaves out the sometimes difficult-to-place non-sequitur movements (pg. 71-72). I think this taps back into the purpose and the aim of this novel, not aimed toward advanced graphic novel readers, but fans of the original book. Coraline meeting the friendly black cat for the very first time. See the moment-to-moment/panel-to-panel scene we are in, with the cat licking his back. I wonder if we really need such a miniscule scene (pg 39). Action meets subject is featured here when Coraline spends time with the two aunts down the hall and they encourage her to participate in a magic show. 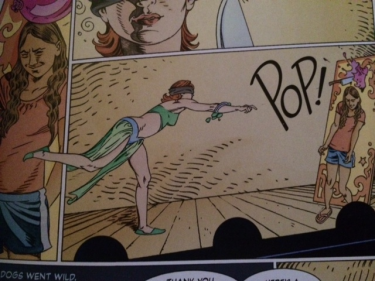 Coraline stands in front of a balloon as the magician throws a knife at her *notice the counter-clockwise sequence* (pg 47). 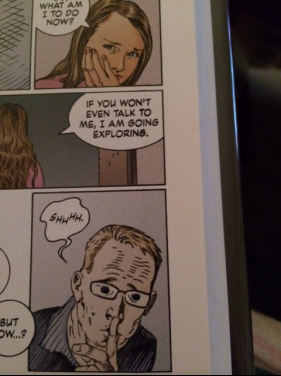 Subject to subject transition while Coraline is speaking to her “other” dad (pg 79). These examples simply show that the story is extremely linear, and there are barely, if ever any “breakages” in time. The story uses chapters and page breaks to separate the time and setting, and does not rely on the audience for such a task. In terms of semiotics, there are moments of wholes and parts that commit closure (what happens “within”). Sean Hall (This Means This, This Means That) mentions wholes and parts as the action that completes the incomplete (audience must rely on past experiences to fill the gap). Whether we mix up or rearrange words or parts of an image, we can make sense of the totality of the piece. 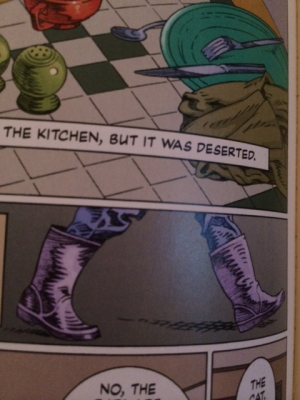 Small instances of wholes and parts can be found throughout Coraline, like here when we only see purple rain boots, but we know that someone is walking toward the room Coraline and her “other” father are in. We do not need to see the person’s entire body or setting to know where she is going, so we are not only filling the parts but making interferences. Examples of wholes & parts (pg 78). Also on page 8 when viewing a few of Coraline’s favorite things that keep her occupied: we only see a part of the VHS tapes and books and we must rely on bits of intextuality to make the connection with the written titles (see below). Only seeing half of a book/tape. Our past experiences fill in the rest (pg 8). 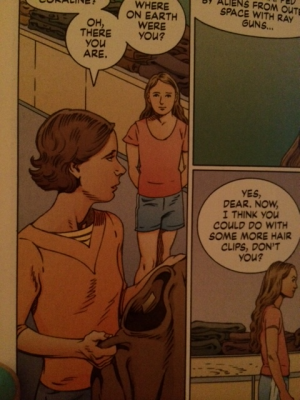 Overall, this was a new experience for me to look at a graphic novel with a purpose. I feel like the graphic novel of Coraline was more concerned with telling the story true to the original adaptation, but could work as a basic graphic novel that stays true to some of the theories McCloud discusses.